The phrase “Drill Baby Drill” may be on some minds recently, but not on mine. I’m chanting, COOK BABY COOK! I have been feeling so inspired to cook recently and have been loving the preparation of putting together a quick and simple week night meal or a more elaborate Sunday night dinner. I have a few ideas as to the genesis of this inspiration – it may be my proximity to great southern California produce, or perhaps all the free time I have as I am unemployed, or it could be the windfall of culinary gadgets my husband and I received for our wedding. Selfishly speaking, one of the best things about getting married – aside from George, of course, is the wedding registry. The concept of a wedding registry was first developed in 1924 by the Marshall Fields department store in Chicago. At that time, the concept of a wedding registry was limited one; it was a means for engaged couples to share their selected china and silver with their guests. Today, a wedding registry is the “super-sized” version of the 1924 model. Registries today provide engaged couples with a carte-blanche to request anything and everything relating to the kitchen – from food processors, to everyday flatware, or to a pink silicon spoonula. It is also customary to register for bedroom items like new linens or blankets, or even bathroom essentials like towels and shower curtains. And while the registry was originally thought of as a means for couples to ask for a few nicer items for the home, it would not be uncommon to see an engaged couple today registering for a honeymoon or a flat-screen plasma TV. Although my wedding registry did not include home electronics (to George’s dismay) or a trip around the world, we did register for everything for the kitchen, except for the kitchen sink, of course! What started as a culinary fantasy became a culinary reality thanks to our very gracious friends and family. We now have wonderful kitchen tools like a pasta maker, roasting pans, beautiful serving platters, and the pièce de résistance – fabulously sharp knives (no pun intended, but I know firsthand…I already had a cooking calamity and lost my index finger’s finger nail….). As I have been trying to test out all my new tools and utensils, I had an idea for a Caprese salad, which not only allowed me to break out my new food processor, but take advantage of the beautiful heirloom tomatoes at the local farmers’ markets. When tomatoes and basil are in season, there are few things better than a traditional Caprese. Gorgeous tomatoes layered between sliced mozzarella and fresh basil…seriously, what more could you want? Well, how about a little bit of basil in each bite? My twist on the traditional Caprese is two-fold: first, I prefer a stacked Caprese – mainly for aesthetics; and second, and most important, I infuse basil throughout my Caprese by using it in a dressing, rather than placing it haphazardly on the salad. Using my new food processor, I made a dressing for my Caprese that resembled a pesto. I begin my chopping one whole garlic clove and several handfuls of basil. To that, I add the juice of one lemon, salt and pepper to season and enough olive oil to thin the mixture into a salad dressing. I find that the fresh lemon juice really pops the basil flavor, which in the affectation of the Oprah–yodel, makes the dressing fabuLOUSSSS…. 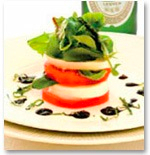 I simply pour a few teaspoons of my basil dressing over my stacked Caprese and enjoy. This salad could be served as a side dish to grilled fish, chicken, or steak, or could even be served on its own as a first course. Either way, it is a refreshing, seasonal twist, on a traditional Caprese, which could not be accomplished without my new food processor! And with that, COOK BABY COOK! This entry was posted on October 24, 2008 at 11:26 pm and is filed under California Produce. You can follow any responses to this entry through the RSS 2.0 feed. You can leave a response, or trackback from your own site.